Merton Council is calling on everyone living in the borough to get involved in Merton’s Mega Recycle and recycle as much as possible. The council has added a fun and competitive element to its latest recycling initiative, offering residents and schools the opportunity to win hundreds of pounds in cash prizes. 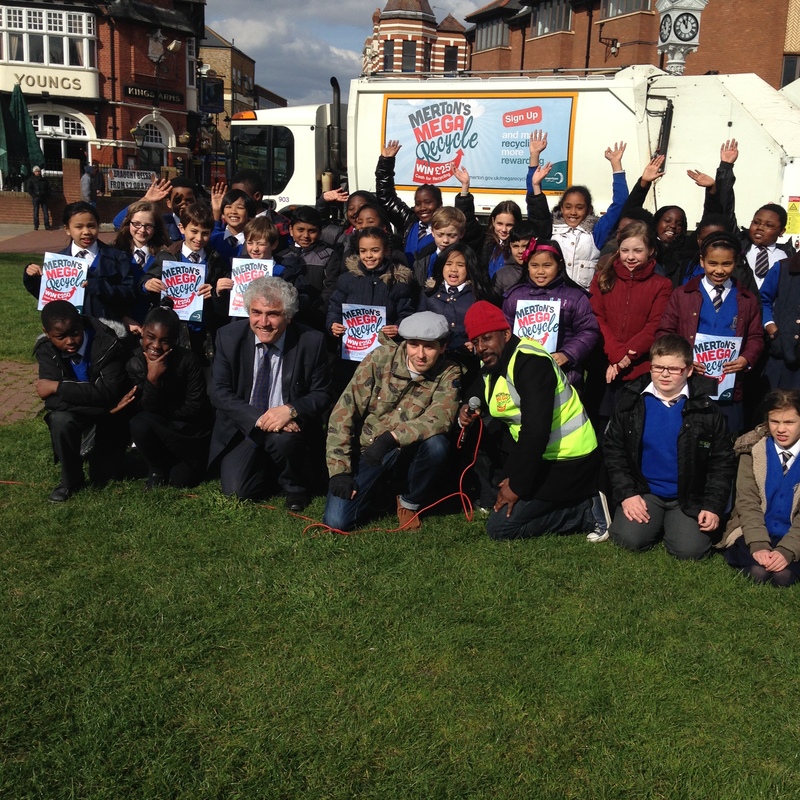 Leader, Councillor Stephen Alambritis joins St Thomas of Canterbury pupils, Merton Mega Recycle singer Mark Professor and composer/producer WrongTom. To kick off the Merton Mega Recycle, the council visited Lonesome Primary School assembly with special guest reggae star Mark Professor singing his latest number Merton’s Mega Recycle. They also went along in the afternoon to Mitcham Clock Tower on Fair Green and joined children from St Thomas of Canterbury Primary School to celebrate the launch. All residents need to do is sign up on the Merton Mega Recycle website and get recycling. A team of Mega Recycle promoters will be knocking on doors from the 22 April with special Merton Mega Recycle packs including information on what and how to recycle and a paper pledge form for people who prefer paper to digital. They will also hand residents a sticker to stick on their recycling boxes so the council’s recycling crews can see who wants to be part of Merton’s Mega Recycle. When residents sign the pledge, they also have an opportunity to nominate a primary school for a cash prize. There will be rewards for individuals who recycle. Residents living on estates are also in with a chance of winning cash for the whole estate. The more an estate recycles, the more likely they are to win up to £10,000. The same goes for people living in blocks of flats. The blocks which increase their recycling by the largest percentage could win up to £3,000 to spend on things to benefit their block such as a new carpet or plants for communal areas. There is no need to sort your recycling – residents just need to put it all in their green or purple box or communal bin. The council is also encouraging people to recycle their food waste too, which it collects the same day as the recycling and black sack landfill waste. Everyone who signs up will be entered into the draw every month. Eleven households will be randomly selected each month: one will win £250 and the other ten will win £100. The council will be updating its leader boards so everyone can track their progress. 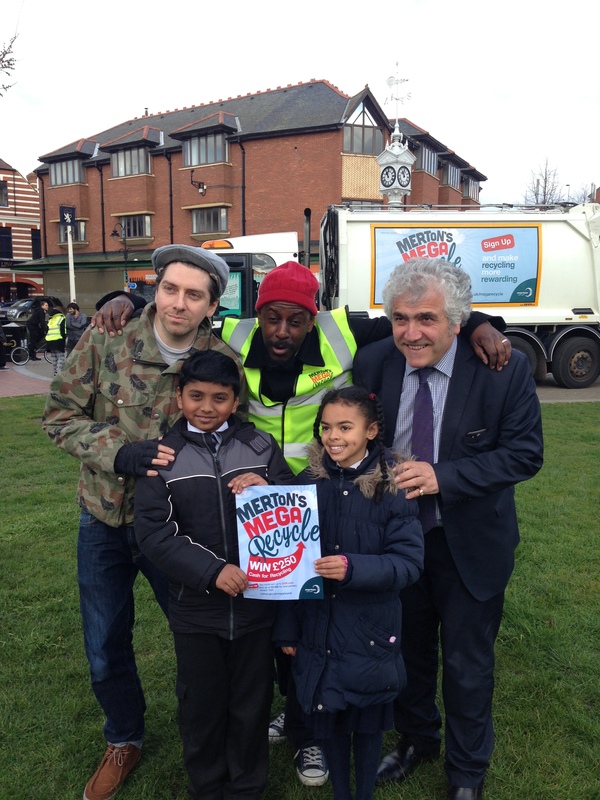 Council Leader Councillor Stephen Alambritis at the Merton Mega Reycle launch with singer Mark Professor (middle), record producer WrongTom and two children from St Thomas of Canterbury School in Mitcham. Check out merton.gov.uk/megarecycle to find out more about Merton’s Mega Recycle, how to take part and the prizes available. The council also collects food waste and black sack rubbish every week all on the same day. The funding for this initiative comes from the Department for Communities and Local Government.